As you know, Lady McKenzie is A.D.D. (And, No. She has not been diagnosed by the Royal Doctor--just by me, her faithful and loyal servant). So much so, that she simply can not focus on any one task at a time. She can't. She is wired to keep 20 things spinning 'round in that wee brain at the same time. Too much to focus on performing one simple task to perfection. For example, she knows very well how to sit. She also knows how to spin, run, jump, bark, wait, lay down, play dead and many other various wonderful activities. So, when asked to sit, all those other things come first and then the sit. It's just more fun to show off everything you know all at once. With all that going on in her brain, she gets really startled by unexpected noises or movements or smells or shadows. Yup. She's pretty much a scared- y cat. So I've had to really work with her to 'get over it' and 'move on'. If an airplane flies over, she's scared. If a truck goes by, she's scared. If a breeze blows a bunch of leaves by, yep, she's scared. If the teeter moves (which is what makes it a teeter), she's scared. That's why she was 'held back' in beginning agility. She got scared on the teeter and would never go back. Period. Done. Not doin' it. So, while her brother, Lord Malcolm has become the most popular dog in his advanced beginning agility class, McKenzie is just known as 'freak dog' in her class. (OK. I made that up, but you get my drift). Her buddies have moved on and she has to learn to get along with a whole new set of friends. --Hey!--That's really not so bad, is it? In fact, I think it's really making a difference for her. She really likes the dogs that are in her class this time. To get her used to the teeter, I bought someones homemade teeter totter, along with some other agility and obedience equipment. Took forever to get her to just walk across a flat board with no movement what-so-ever. We finally got that going at home. So the 'jist' of my story is this..........McKenzie's class met yesterday afternoon. When we arrived, a whole course was set with tire jumps, window jumps, chute, pause tables, boxes, 2 tunnels, A-frame and along the wall, the wiggle bridge, the ladder, wobble board and the much dreaded teeter. Let me explain that the teeter was laid flat across two flat tables and could only move about 6-8 inches or so. We had been practicing it laying flat on the ground, so this was no shock. We did a couple of jumps to warm up before class and then I decided to walk the row that had the much maligned teeter. 'Kenzie. Ready? Walk it (ladder), walk it (wobble board), walk it (wiggle bridge; and wow. No problem), walk it easy (teeter). Dang! She did it all without an issue. I jack potted her with treats and we left the ring to go practice down-stay. (Tracy Hendricks was working one of her beautiful boxers in another ring and I thought McKenzie should see that boxers CAN behave properly--which she did notice and never broke her down-stay). Any way, time for class. We all walked the row with the wiggly stuff a couple of times and NO ONE had an issue. Amazing. What's up with that? Then we all took turns running the entire ring starting with the tire jump. Which McKenzie refused. Great. Now what's going on in that crazy brain of yours? So I tossed a treat through the tire and she jumped it. Same thing at the window jump. Oh, dear! It's going to be one of those days, is it? So with much cajoling, guiding and demanding, we made it through the course. Then the instructor got a brilliant idea. She placed a target after the 2nd jump and I sent the dog. She jumped 1, 2 and got her treat. We did that a couple of times and then increased it to 3 jumps. After this, we tried the course again. This time, I placed a treat passed the tire, set her up and told her to go. Wow. She went through it and got her treat. Then I placed a treat passed the window jump and set her at the tire. Not only did she go through both jumps to get her treat, she went through the chute and to the table to sit. Yep. The light bulb had just turned on. She ran that entire course without a leash and never tried to run away. She listened to every direction I gave and did what I asked. She had so much fun that she wanted to do it over and over and over again. And so did I. I've never had such a moment with her. She actually looked like an 'agility' dog. We both had a great time and this goes to prove my point. 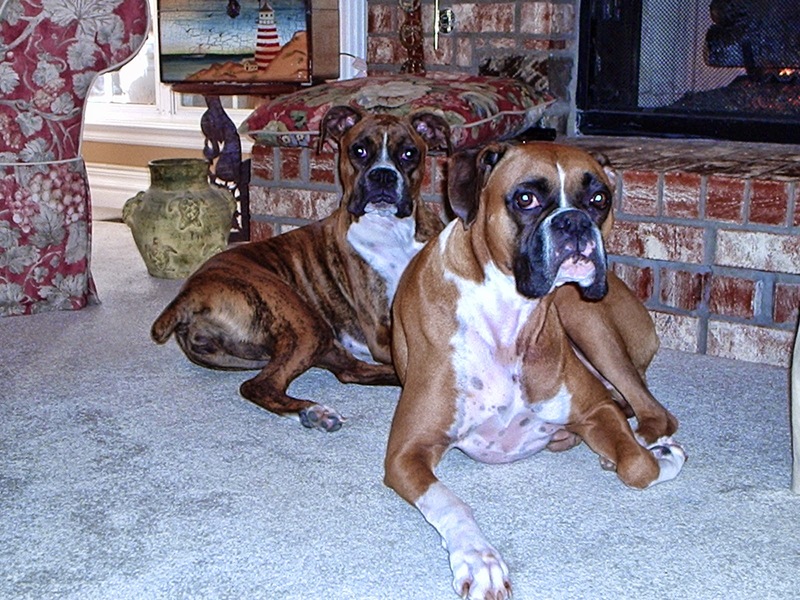 With a lot of patience and determination, boxers (even boxers with A.D. H. D.) can 'turn on'. I don't know how many times we did the teeter, but it was a lot and she was practically running full out on it. The next hurdle with be when it's set for more movement, but we'll cross that bridge when we get to it. In the mean time, I'm so proud of her, I just had to blog! The following are pictures of what was in Malcolm's intestine. The last is a picture of the dog toy it came from.